With more households switching over to a cleaner diet consisting of more fresh foods, the pantry is getting less crowded and the fridge is getting full. Using every inch of space available is key to achieving an organized refrigerator. The tips below will get things in order and help make more room. To maximize space, organizing items in the fridge is key. Plastic storage bins are great because you can see through them in order to find the items you are looking for. They can be organized by food groups, or even lunch and dinner weekly meal plans. This makes packing lunches early in the morning or cooking quick meals on busy weeknights much more efficient. Baskets can also be used to organize items, and they can be extra useful if they have handles so the baskets can be easily removed from the refrigerator for meal preparations. Plastic dividers placed in vegetable bins can maximize space by keeping items separated and neat. Storing food on shelves or in bins is obvious, but you can also make use of underused space underneath those places. If your refrigerator has wire shelves, clip bagged items to the bottom of the shelf with binder clips or chip bag clips. Under-shelf drawers are another great space-saving solution. These easily slide onto a plastic shelf, creating several more inches of useful space for storing items. An egg carton is another useful tool that can double as a condiment rack in the fridge door, keeping those bottles organized and eliminating clutter. Calling a professional to service your refrigerator isn’t for just when you need a repair done. They can also help you create solutions to storage problems and make your appliance run more efficiently. One way they can assist you with freeing up more space is by installing or connecting an in-door water and ice dispenser. This will eliminate the need for water bottles and ice trays, thus allowing space for other items. The professionals at Speedy Refrigerator Service can assist you with any type of repair that is needed. 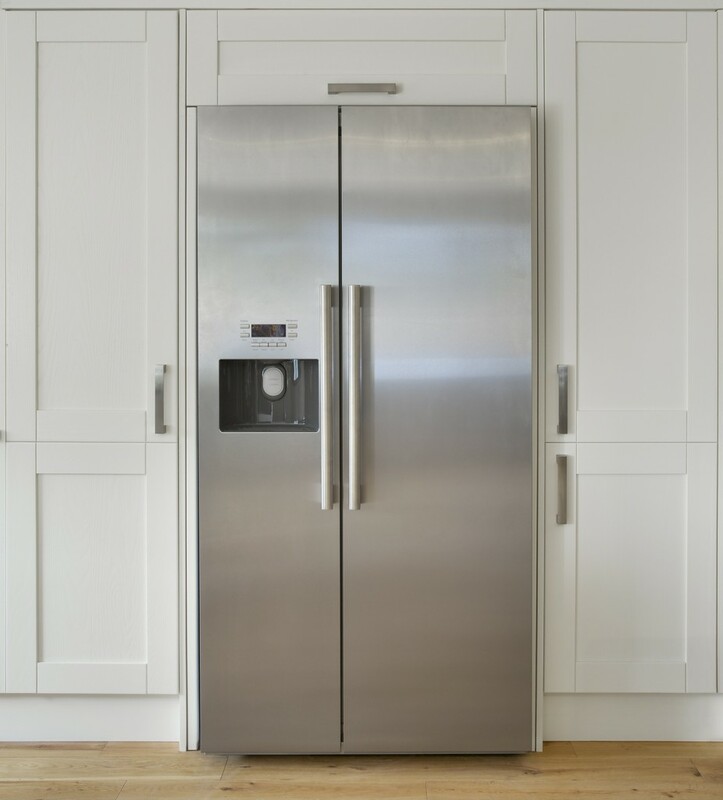 They have been servicing refrigerators in Long Island for over 75 years and are highly qualified. Contact them for any of your freezer or refrigerator repair needs in the Long Island area. In life, people always seem to think they have the best way of doing things. When it comes to the refrigerator, that trend remains the same. What some might not know however, is that making assumptions when it comes to food storage can be dangerous. 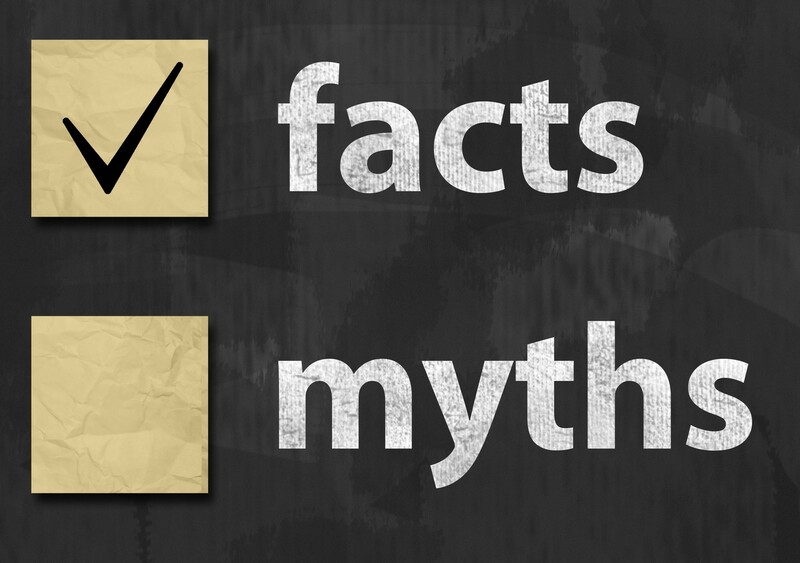 That is why it is important to be able to separate refrigerator myths from facts. Myth: The dial inside the fridge tells me exactly how cold it is. Fact: This actually isn’t true. The only way to accurately measure the temperature inside of your fridge is to use a standing thermometer. Buy one next time you are at the store and make sure your fridge is running at a temperature below 40ºF! Myth: To keep my refrigerator from overexerting itself, I should leave food sitting out to cool. Fact: This one would also be false. While taking food directly from the stove to the fridge isn’t recommended, leaving it out isn’t either. If you want to store something away for later, let it sit for about ten minutes, and then seal it up and stow it away. Food should not remain unrefrigerated for more than two hours. Myth: Leaving frozen meat out on the counter will defrost it faster. Fact: While this one is technically true, it doesn’t make it any safer. Even if the meat is frozen, that doesn’t mean it is not capable of being contaminated with bacteria. Plan out your meal in the morning and defrost things in the refrigerator. That way they have more time to defrost and you will ensure yourself a safer meal to consume. The biggest lie you can tell yourself is that your old refrigerator is still getting the job done. If you notice constant temperature problems or leaking water, you should contact the refrigerator specialists at Speedy Refrigerator Service. We have been serving the NYC and Long Island areas for over 50 years and we would love to take care of you. Unfortunately, a bigger kitchen is not always attainable, so you need to make due with the space you currently have. Spaces like the one above your fridge can serve a purpose if you utilize them correctly. Check out some creative ways to take that area above your fridge from space waster to space saver! Shelves are easy to put up and can save you a ton of space in the kitchen. If your cookbooks are currently in a drawer, you are doing it all wrong. Hang some shelves above your refrigerator and stock your books up there. Now you can use that drawer for more oftenly-used items like Tupperware and utensils. Some people actually take the space above their fridge and turn it into an entertainment center. Mounting a television in this area is great for watching the morning news or your children’s favorite cartoons. Hanging a wine rack on the wall above the fridge is a great way to keep it from getting in the way. There is no need to have it on the floor where bottles can be knocked into and broken. Nobody likes when wine goes to waste! Take wood or felt storage boxes that match your wall paint and stack them on top of your fridge. We wouldn’t recommend putting frequently used items up there, but it is not a bad spot to store holiday kitchen decorations. Now that you are an expert on the space above fridge, let us handle what is on the inside. If your fridge is having trouble getting through this hot summer, look no further than Speedy Refrigerator Service for your repairs. Call (866) 782-9376 to schedule your same-day appointment, or visit us on the web. The best kind of meals are the ones large enough to feed the whole family. Whatever recipe you are trying for a Sunday meal, it is best to double it for good measure. But after that meal is over and you feel like you’re going to explode, it is time to store that food so you can pick on it throughout the week. 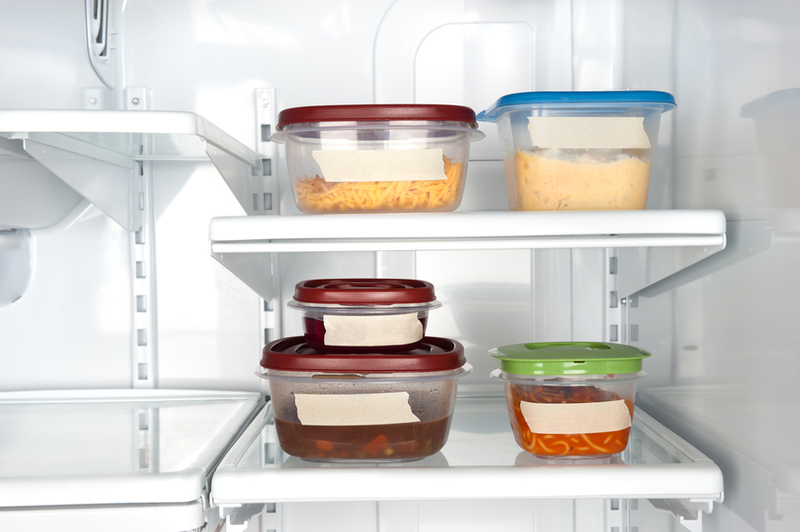 Make sure you are storing your leftovers properly, because inadequate storage can lead to food poisoning or worse! Don’t let your food sit out for more than 2 hours without being refrigerated. When you have a large amount of leftovers, it is best to separate them into smaller containers. This will allow the cool air to circulate around the food and stop bacteria growth before it even starts. With any kind of stuffed meats, it is best to remove the stuffing and refrigerate them separately. If you choose to leave the stuffing inside, you run the risk of it becoming too warm and possibly contaminated. Refrigerated leftovers should be consumed within 4 days of the time they were cooked. Anything longer than this and it should be kept in the freezer for safety. Bacteria can’t grow in freezer temperatures, so this will allow you significantly more time to enjoy your food than refrigerator storage. When you reheat leftovers, it is not enough to just make them warm. Food should be microwaved to a temperature of 165°F, or until you can see it steam. The optimal temperature for refrigerator food storage is between 34-38°F. The key to safer leftovers is having a fridge that can get the job done. If your fridge is having trouble maintaining the optimal temperature, there is a chance it is need of repair. Speedy Refrigerator Service has been serving the New York City and Long Island area for over 75 years and we would love to help you out! Call (866) 782-9376 to schedule your same-day appointment, or visit us on the web.